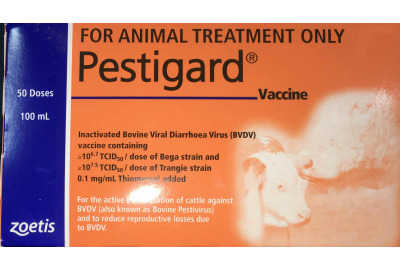 Pestigard® is the first vaccine for the prevention of Bovine Viral Diarrhoea Virus (BVDV), otherwise known as Bovine Pestivirus in cattle in Australia. For the active immunisation of cattle against BVDV and to reduce reproductive losses due to BVDV. The recommended dose for cattle of all ages is 2mL. Two doses of Pestigard® should be administered 4-6 weeks apart with annual boosters thereafter. The first dose of Pestigard® may be given up to 6 months before the second dose to suit management practices. Immunity does not develop until at least 14 days after the second dose. This product can be stored and used for up to 30 days after first opening. On each subsequent reuse, swab the opening with a suitable disinfectant (for example, methylated spirits) both before and after using. A sterile needle must be used each time product is removed. Store unused material upright, at 2oC to 8oC (refrigerated) and in the original cardboard packaging to protect from light.